When I started my #101drams Charitable Challenge, one thing I wanted to focus on was world whiskies. Sure the list has plenty of Scotch whisky, but I wanted a good selection of lesser-known whisky regions too - hence the likes of Czech Republic, Finland, Sweden...and even France. I came across Brenne (the creation of whisky fanatic, spirits importer/exporter, and blogger - the very generous Allison Patel) on Twitter a few months ago. A French-made whisky aged in new French oak and finished in Cognac casks? Sounded impressive! Brenne bottle all their whiskies from single casks (my sample was #259), and are NAS as the age varies with each release (though on average, the whisky is 7 years old). Distilled in Cognac, France, and distributed in the US, Brenne was only released in October 2012, and is quickly gaining a reputation throughout the US. 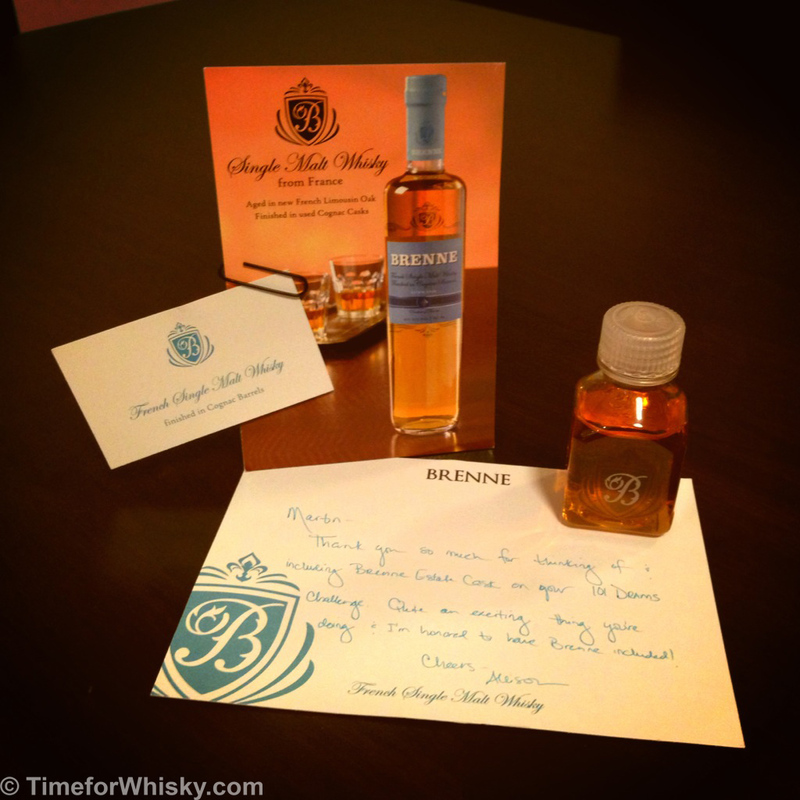 As Brenne isn't yet available in Australia, Allison was kind enough to send me a sample (which due to restrictions on sending alcohol, needed to route via Florida before it could make it to me in Sydney! ), including a few tasting notes and a very nice hand-written card (take note, other boutique whisky producers looking to get the word out!). Nose: Big creamy cheesecake hit. Sweet, but not in a sherried way like a big robust Speysider. Think dessert (really delicious dessert). I've never had a whisky with a nose like this, and I absolutely love it. Just makes you want to dive right in. Palate: Initially light. In fact it remains light throughout. Flavours of almond cake, vanilla, shortbread, cookies and cream. This is really delicious. Finish: Just perfect. Medium length, the dessert notes start to fade and a very soft hint of spice hits at the end (the notes say peppercorn, I get cinnamon and a hint of oak. Love the idea of it being finished in cognac casks. This sounds delicious, so I hope it makes its way here some day! If you're still after a bottle of Brenne, I have one which I may sell. Bought in San Francisco a few weeks ago and brought back on the plane.